As much as I love simplicity and comfort of home cooking, I also love eating out. Mostly I prefer casual places. Bistros and wine bars where the food is straightforward and delicious and there’s no pretense or snobbery. But every now and then I like to treat myself to some world class fine dining. If you’ve been reading Stonesoup for a while, you may remember a few years ago I managed to score a reservation at the Spanish restaurant el bulli – which held the title of best restaurant in the world (and most difficult to get a reservation for). Eating at el bulli was an amazing experience. But to be honest, I enjoyed my recent lunch at Noma – the current holder of the ‘best restaurant’ crown, even more. For starters, the Noma decor is more my style – Scandinavian minimalist with an emphasis on design. And I loved that they don’t have any wait staff. The chefs bring your food and describe each dish – perfect for asking questions. Like el bulli, many of the dishes at Noma are quite conceptual. And at the same time, you can see that they’re having some fun. But the thing that pushed Noma to the top for me was the obvious care they take with their ingredients. And that pretty much everything was just really delicious. 1. Cook an ingredient on one side only. There were three examples of this throughout our lunch. Cauliflower that was charred on one side and steamed so it was cooked through. Baby cucumbers that had been charred on one side and left crunchy on the other. And a dehydrated carrot dish that was also charred on one side. The beauty of this idea is that it adds variety and complexity without using any more ingredients or taking any more time. I’ve tried it with chorizo (recipe below) but the possibilities are endless really. 2. Treat veg as the main event. Vegetables featured heavily on the Noma menu. The closest we got to red meat was sweetbreads. One of the standout dishes was the cauliflower charred on one side and served with a horseradish sauce. At fist glance it looked like a piece of meat. Really delicious. 3. Use fermented foods to add complex flavours. There were a couple of courses using fermented split peas that had the most wonderfully complex flavours. One of the chefs mentioned that the closest ingredient would be miso paste – if you aren’t up for some home split pea fermentation. 4. Explore your local ingredients. I love how the guys at Noma champion their local produce – especially ingredients that are foraged in the wild. They even push the boundaries of what we consider to be food. Ants anyone? (For the record the ants were very tasty and quite tart). It’s more than ‘making do’ with what you have. It’s about celebrating what’s unique and special about where you call home. Adapted from my favourite food writer, Nigel Slater in his latest book the Kitchen Diaries II. When I say I ‘adapted’ this recipe, the only thing I really changed was adding in a splash of lemon juice for freshness. It’s not very often I find myself adding an ingredient to other people’s recipes! 1. Heat a frying pan on a medium high heat. Add a little oil and the chorizo. Cook for 2-3 minutes or until well browned on the first side. 2. Turn and cook for a few seconds on the other side. Remove from the pan to a clean plate. 3. Add garlic and kale to the chorizo oil in the pan and stir fry for 2-3 minutes or until kale is wilted and tender. 4. Return chorizo to the pan to warm up. Taste and season with salt, pepper and a small squeeze of lemon. 5. Serve with almonds sprinkled over. vegetarian – replace chorizo with sliced halloumi and add in a teaspoon smoked paprika with the kale. vegan – replace the chorizo with 2 large red onions or bell peppers (capsicum) chopped. Cook on a medium heat until soft. Add kale and 1 teaspoon smoked paprika and continue to cook as per the recipe. Double the almonds to serve. no chorizo? – use spec, chopped bacon, pancetta, salami or even ham. different greens – most greens will work well here. Try cavolo nero, collard greens, spinach, silverbeet (chard), rainbow chard even baby spinach or defrosted frozen spinach. Cabbage, brussels sprouts, broccoli, asparagus, broccoli rabe can also be used but will need a little longer to cook. 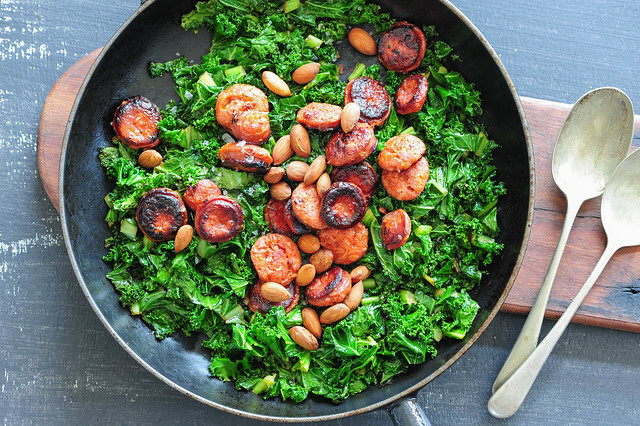 budget / more substantial – make the chorizo go further – toss in a drained can of chickpeas or white beans with the kale. sunday breakfast – serve topped with a poached or fried egg. ps. If you’d like to see the photos of our Noma lunch, I’ve set up a slideshow over here. Be warned they’re from my phone so the quality isn’t very good. Thanks for the tip about the veg on one side – I can totally see why that works! I’ve charred food on one side including Kale by accident including kale from my garden recently and it tasted good but I felt guilty, now I can do it and feel validated – the best restraint in the world cooks it this way – thanks! Wow, I’ve never thought to char food only on one side! Mind slightly blown (almost like when I moved to New Zealand and realised what an English fried egg looks like – very different from a Chinese fried egg). Glad to hear you’ve had your mind slightly blown eemusings! Fermented split peas? I really like the sound of that! it´s sounds to me delicious. I have just discovered this blog. I am itching to try some of your recipes! This one will be one of the first – it looks amazing. looks like a great simple and tasty recipe. i’m not sure about the whole almonds but perhaps would swap with toasted pine nuts or maybe toasted slithered almonds instead. Either would work well Simon! I always thought my propensity to cook things on one side was just me being a weary cook, but I agree that it IS a great way to impart flavor. thanks always for the amazing tips. the photos are wonderful by the way! Cheers! Glad to hear you’re already all over this Samantha! Great recipe using some of my favourite ingredients. I must try it but I will use chard from the garden. Nice little video too! And lucky lucky you getting to eat at Noma. I am literally turning green with jealousy! I feel very lucky to have eaten at Noma! I haven’t got out to the shop for chorizo yet so I’m still waiting to try this one. But I did try this technique with asparagus last night. It was great! Thanks for a great blog – I’ve added a link to you from my blog in a discussion of chickpeas. Made it! I had a friend for lunch and so I made it with baby spinach and served it on wholegrain toast. She loved it. So did I – but it was really filling and I won’t need much dinner! Thanks for a lovely recipe. Will definitely make again. Thanks for the tips! I will try to remember them. What is a “dehydrated carrot dish”? I just got a dehydrator and am now drying fruit but would love to try veg! It looked like carrot that had been dried out like fruit – why don’t you try it and report back! I love the straight forwardness & simplicity of your recipes and the warm, to the point and down to earth way that you write! I really enjoy reading what you’ve put out. We’re an age inundated with information and opinions, so finding a refreshing voice among the throng of voices is refreshing! Keep up the great work and thank you for sharing.